^ a b c d e f g h "The House Of Wessex". www.englishmonarchs.co.uk. Retrieved 28 December 2018. ^ a b Connolly, Sharon Bennett (10 December 2016). "Edgar – The Boy Who Wouldn't Be King". History... the interesting bits!. Retrieved 28 December 2018. 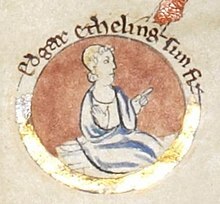 ^ a b c "Edgar The Aetheling | Anglo-Saxon prince". Encyclopedia Britannica. Retrieved 28 December 2018.